You are currently browsing the tag archive for the ‘Atom’ tag. Night Shade is a young adult novel which focuses on Calla Tor, a young werewolf. When the novel opens, she is a few months away from turning seventeen, and on her seventeenth birthday she will marry Renier Laroche, another werewolf. Their union has been decreed by the Keepers, their masters. Calla has known since she was five that she was destined to be mated with Ren and that together they would create a new pack. And Calla has accepted that, just as she’s accepted that it’s fine for Ren to sleep with every girl in school but she must remain pure until their union. She’s also accepted that the Keepers dictate their lives, and that the Packs (known as Guardians) must serve the Keepers in their fight against the Searchers. But Calla isn’t entirely happy about all this. She resents the way others run her life and tell her what to think and what to do. She’s drawn to Ren, but isn’t sure she loves him. And there’s much about the way the Keepers treat the Guardians that makes her uncomfortable. Everyone around her seems to accept it, and so Calla falls in line – but she couldn’t really say that she’s happy. Then one day Calla meets Shay, a human boy, and breaks more than a few rules to save his life. And then Shay begins to attend her school, and turns Calla’s world upside down. Perhaps she doesn’t have to do what the Keepers say. Perhaps she doesn’t have to do her duty, mate with Ren, and form and lead a new pack. 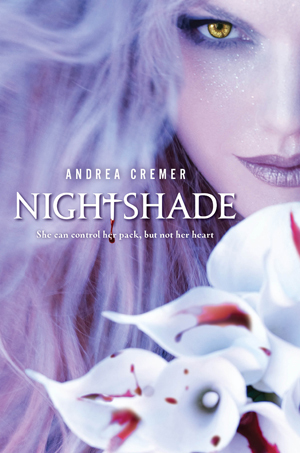 As Calla deals with the turmoil Shay has brought into her life, she also starts to realise that perhaps she’s been lied to all her life – and that perhaps all the Guardians have been lied to. The relationship between the Keepers and the wicked Searchers may not be as the Guardians have been taught. 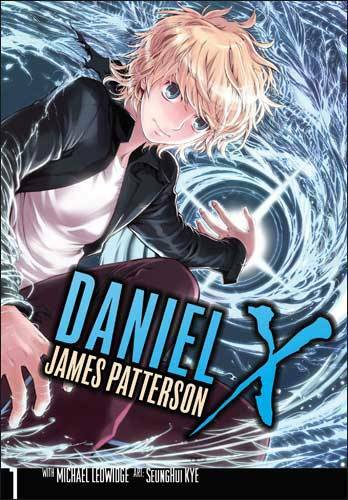 Adapted from James Patterson’s Daniel X novels, the first volume of the Daniel X manga is both entertaining and at times somewhat confusing. Daniel X is a teen alien hunter, on his own since his parents (his father was also an alien hunter) were murdered. He has supernatural powers, such as being able to create tangible illusions, and he is tracking down aliens on “The List”, to rid the planet of their evil ways. As it turns out though, Daniel himself is also on the list, and he finds himself kidnapped and taken to a planet far away, where he learns more about himself and his history. Without the benefit of having read the novels this manga is based on, I struggled a little at various points to figure out what was going on, and I felt the story suffered somewhat for not exploring some of the angles a little more. However, it was a fast and action-packed book, with some interesting characters and plot points that kept me engaged throughout, even when I didn’t really know what was going on. The artwork is manga at it’s best – very cute, but with a stylish edge, and the pictures are a great complement to the story. I like seeing these sorts of manga done well, as they can be a great way for reluctant readers to become involved with longer texts – if they love the manga, it’s easier to convince them to tackle the original novels. Daniel X does a good job of sucking in a new reader and would, I think, also appeal to a Patterson fan of any kind. In Melissa de la Cruz’s world, vampires are the “Blue Bloods” of high society. Reincarnated by a blood creation process, only 400 vampires exist, not always at the same time, and they are part of a complex Heaven and fallen angels scenario from millennia past. Two are even archangels, who descended by choice to watch over those who fell. Cruz has at the heart of her story the young Blue Bloods of this generation, who are maturing, recovering their memories of previous lives, and re-discovering their powers. Mimi and Jack Force, rich, gorgeous and powerful, are two of the next generation Blue Bloods, but there are others, and some of them, like Schuyler Van Alen, are different to those who came before. Blue Bloods, the first book of the series, introduces us to a world of the super rich elite, peopled by vampires who call themselves Blue Bloods. While these vampires do require human (Red Blood) blood, they generally don’t terrorise or kill them, living hidden in plain sight as the rich and famous of their world. Schuyler Van Alen is part of this world, but feels isolated from it – her family’s fortunes have waned over the decades, which means while Schuyler is still schooled at the elite Duchesne school, she doesn’t command the respect of her wealthier peers and doesn’t try to fit in. When a student is killed however, Schuyler finds out she is more a part of the elite crowd than she could ever have imagined. With an unknown threat to all the young vampires, Schuyler finds herself at the heart of the hunt for the murderer, and on the front line of danger. Although there isn’t a great deal wrong with this book, technically speaking, on an emotional level it failed to engage with me to any great degree. It wasn’t exactly boring, but neither was it particularly interesting; in particular, I just didn’t care about what happened to the characters. To some degree, this was just as well, as it isn’t obvious till about a dozen pages before the end that this isn’t a standalone novel – it ends with virtually nothing resolved. 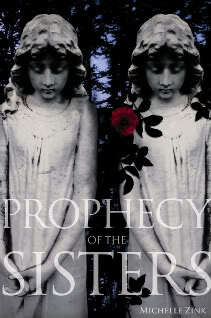 The novel opens as twins Lia and Alice Milthorpe bury their father, making them orphans and the mistresses of Birchwood Manor. In the next few days they will discover their roles in a prophecy which has influenced the lives of generations of twins – one may open the Gate to Satan to enable him to take over the world, while one may bar the Gate to him. First there was a book, then a series, the movies, merchandise, fan fic … everything you can imagine as the Twilight phenomenon rolled over publishing, film and fans everywhere. Unless you’ve been living under a bridge in Outer Mongolia for the last few years, you will have heard of Twilight, and know the story. Just in case, a short synopsis: clumsy girl moves to rainy town, meets sparkly “vegetarian” vampire, falls in love. There’s a bit more to it, but that’s the basics. The Twilight madness that has taken over the world in recent years rivals the Harry Potter juggernaut that invigorated Young Adult and Children’s publishing in the late 1990s and early Noughties. Twilight fans start at a slightly older readership age, and slant more towards the female side of the demographic, but this seems only to make them even more intense in their passion for the books (and author), films (and actors) than those who worship Rowling. 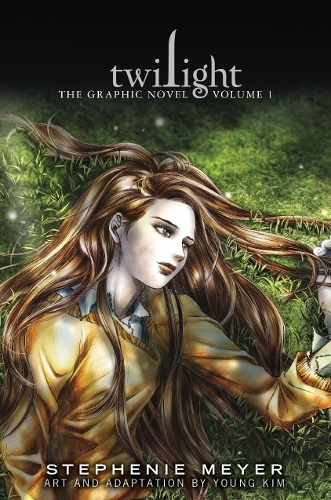 And now Twilight has something that Potterdom doesn’t: a graphic novel.